As the global economy begins to rebound from the great recession, people around the world remain deeply concerned with the way things are going in their countries. Less than a third of the publics in most nations say they are satisfied with national conditions, as overwhelming numbers say their economies are in bad shape. And just about everywhere, governments are faulted for the way they are dealing with the economy. Yet in most countries, especially in wealthier nations, President Barack Obama gets an enthusiastic thumbs up for the way he has handled the world economic crisis. The notable exception is the United States itself, where as many disapprove of their president’s approach to the global recession as approve. This pattern is indicative of the broader picture of global opinion in 2010. President Barack Obama remains popular in most parts of the world, although his job approval rating in the U.S. has declined sharply since he first took office.1 In turn, opinions of the U.S., which improved markedly in 2009 in response to Obama’s new presidency, also have remained far more positive than they were for much of George W. Bush’s tenure. Ratings of America are overwhelmingly favorable in Western Europe. For example, 73% in France and 63% in Germany say they have a favorable view of the U.S. Moreover, ratings of America have improved sharply in Russia (57%), up 13 percentage points since 2009, in China (58%), up 11 points, and in Japan (66%), up 7 points. Opinions are also highly positive in other nations around the world including South Korea (79%), Poland (74%), and Brazil (62%). The U.S. continues to receive positive marks in India, where 66% express a favorable opinion, although this is down from last year when 76% held this view. America’s overall image has also slipped slightly in Indonesia, although 59% still give the U.S. a positive rating in the world’s largest predominantly Muslim nation. Publics of other largely Muslim countries continue to hold overwhelmingly negative views of the U.S. In both Turkey and Pakistan – where ratings for the U.S. have been consistently low in recent years – only 17% hold a positive opinion. Indeed, the new poll finds opinion of the U.S. slipping in some Muslim countries where opinion had edged up in 2009. 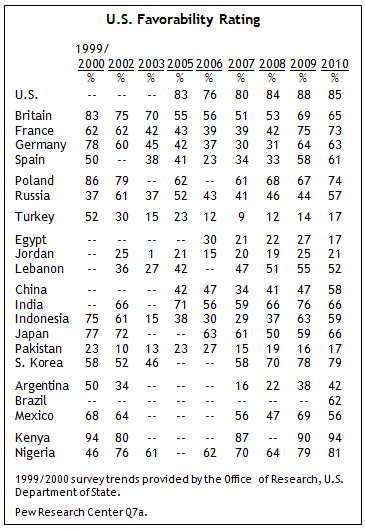 In Egypt, America’s favorability rating dropped from 27% to 17% – the lowest percentage observed in any of the Pew Global Attitudes surveys conducted in that country since 2006. Closer to home, a special follow-up poll found America’s favorable rating tumbling in Mexico in response to Arizona’s enactment of a law aimed at dealing with illegal immigration by giving police increased powers to stop and detain people who are suspected of being in the country illegally. Only 44% of Mexicans gave the U.S. a favorable rating following the signing of the bill, compared with 62% who did so before the bill passed. The new survey by the Pew Research Center’s Global Attitudes Project, conducted April 7 to May 8, also finds that overall opinion of Barack Obama remains broadly positive in most non-Muslim nations. In these countries, the national median confidence in Obama to do the right thing in world affairs is 71%, and overall approval of his policies is 64%. In particular, huge percentages in Germany (88%), France (84%), Spain (76%) and Britain (64%) say they back the president’s policies. Similarly in the two African nations polled Obama gets high marks – 89% of Kenyans and 74% of Nigerians approve of his international policies. Among Muslim publics – except in Indonesia where Obama lived for several years as a child – the modest levels of confidence and approval observed in 2009 have slipped markedly. In Egypt the percentage of Muslims expressing confidence in Obama fell from 41% to 31% and in Turkey from 33% to 23%. Last year only 13% of Pakistani Muslims expressed confidence in Obama, but this year even fewer (8%) hold this view. And while views of Obama are still more positive than were attitudes toward President Bush among most Muslim publics, significant percentages continue to worry that the U.S. could become a military threat to their country. In countries outside of the Muslim world, where the president’s ratings remain generally positive, his standing is not quite as high in 2010 as it was a year ago. The new poll found fewer in many Asian and Latin American countries saying they have confidence in Obama and approve of his policies generally, and even in Europe the large majorities responding positively to his foreign policy are not quite as large as they were in 2009. Besides declines in overall confidence in some countries, strong endorsement of Obama eroded in countries where he remains broadly popular. Notably, in Britain, France, Germany, and Japan, fewer this year say they have a lot of confidence in Obama’s judgment regarding world affairs, while more say some confidence; still there was no increase in the percentage expressing no confidence in Obama in these countries. 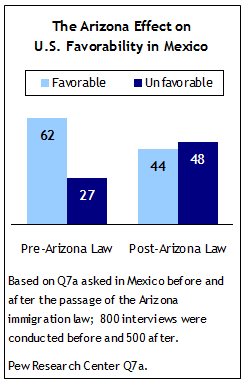 Even though Obama has called the Arizona immigration law “misdirected,” it is nonetheless having a negative impact on views of him in Mexico. Prior to the law’s passage, 47% of Mexicans had confidence in Obama’s international leadership, but after passage only 36% held this view. More specifically, 54% of Mexicans say they disapprove of the way Barack Obama is dealing with the new law, and as many as 75% say that about Arizona Gov. Jan Brewer. Perhaps more significant than Obama’s small declines in ratings is that a generally positive view of him and the U.S. coexists with significant concerns about the American approach to world affairs and some key policies. This was not the case in the global surveys taken during President Bush’s terms in office, when specific criticism ran hand in hand with anti-American and anti-Bush sentiment. Then, as now, one of the most frequent criticisms of U.S. foreign policy is that in its formulation it does not take into account the interests of other countries. This is the prevailing point of view in 15 of 21 countries outside of the U.S. Somewhat fewer people in most countries level this charge than did so during the Bush era. 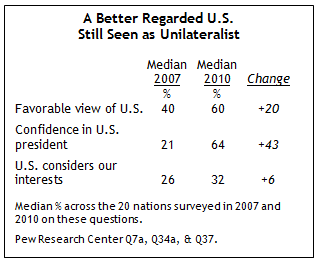 Currently, the median number saying that the U.S. acts unilaterally is 63%; in 2007 a median of 67% expressed that view. In contrast to the Bush years, there is substantial majority support for U.S. anti-terrorism efforts in Britain, France, Spain and Germany. The new poll also found major increases in support of the American efforts in two countries that have been struggling with terrorism of late: Indonesia and Russia, where roughly seven-in-ten say they back the U.S. in this regard. Publics in India, Brazil, Kenya and Nigeria also express strong support for U.S.-led efforts to combat terrorism. However, opposition to these policies is particularly strong in most Muslim countries, and it is also substantial in many nations where the U.S. is fairly well-regarded, including Japan and South Korea. The war in Afghanistan remains largely unpopular. In Germany, which has the third largest contingent of allied troops in Afghanistan, nearly six-in-ten people favor withdrawal from that country. Opinions are more divided in NATO allies Britain, France and Poland. 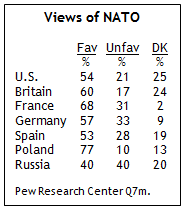 In most other countries surveyed, majorities or pluralities also oppose the NATO effort. 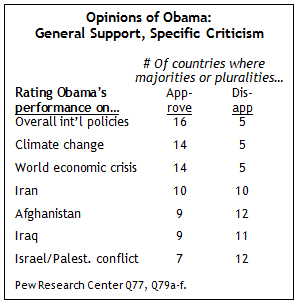 Global opinion of Barack Obama’s dealing with world trouble spots parallels general opinion of U.S. policies in these areas. With regard to Afghanistan, Iraq and Iran, the polling found as many countries approving as disapproving of his handling of these issues. However, the American president gets his worst ratings for dealing with another world problem for which the U.S. is often criticized: the Israeli-Palestinian conflict. Of 22 nations surveyed including the U.S., in only three nations do majorities approve of Obama’s handling of the dispute: France, Nigeria and Kenya. In sharp contrast to criticisms and mixed reviews of Obama’s handling of geo-political problems, Obama not only gets good grades for the way he has handled the world economic crisis, but also for dealing with climate change. In most countries, people approve of Obama’s climate change efforts. France is a notable exception, with a 52%-majority disapproving, despite the country’s approval of his other policies. Global publics are mostly glum about the way things are going in their countries. And, despite signs of economic recovery in many parts of the world, people nearly everywhere, with the notable exception of China, India and Brazil, complain that their national economy is doing poorly. Moreover, there is little optimism about the economic future. And in the wake of Europe’s sovereign debt crisis, more Europeans say integration has hurt their economies, although overall ratings for the EU remain favorable. In 20 of 22 countries surveyed, less than half the population is satisfied with the direction of the country, including only 30% of Americans. Lebanese (11%) are the least satisfied. Only in China does an overwhelming portion of the population (87%) express satisfaction with national conditions. Overall, assessments are up in nine countries and down in only five. Few people are happy with the current state of their national economy. In only four countries: China (91%), Brazil (62%), India (57%) and Poland (53%) do publics say economic conditions are good. All four of these nations weathered the global recession relatively well. Economic gloom is most widespread in Japan, France, Spain and Lebanon, where roughly one-in-eight believes the economy is doing well. But there are signs that an economic recovery may be taking hold. In ten of the countries surveyed, people’s assessment of the economy improved significantly from 2009 to 2010. Only in four nations did it recede. Still, global publics are taking a wait-and-see attitude about the economic future. In only seven of 22 societies does a majority of those surveyed think economic conditions will improve over the next year. The economic bulls in the survey are the Chinese (87%), Nigerians (76%) and Brazilians (75%). The Japanese (14%) are the most bearish. Disgruntled people generally fault their government for their country’s economic troubles, although many also blame banks and themselves; few blame the U.S. The most satisfied with their government’s economic performance are also those who have experienced some of the strongest growth in the last year. Roughly nine-in-ten Chinese (91%) say Beijing is doing a good job. Indians (85%) and Brazilians (76%) are also quite pleased with their government’s economic management. Despite some of the worst recent economic conditions since the Depression, support for free markets remains strong, with some of the most tepid backing in Argentina (40%) and Japan (43%). And people continue to favor trade and globalization, with the weakest – but still majority – support in Turkey (64%) and the U.S. (66%). A growing number of people around the globe see China’s economy as the most powerful in the world. Looking at the 20 countries surveyed in each of the last three years, China’s economic star keeps rising. 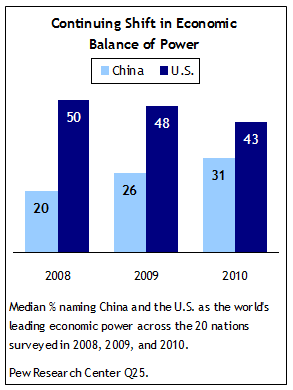 The median number naming China as the world’s leading economy has risen from 20% to 31%. Meanwhile, the percentage naming the U.S. has dropped from 50% to 43%. The publics of the countries surveyed vary in their views of China’s growing economic clout. In the West, opinion is divided in Britain, while majorities in Germany, France and Spain and a plurality in the U.S. see China’s economic strength as a bad thing for their country. The Pakistanis (79%), Indonesians (61%) and Japanese (61%) regard China’s rising economic power as a positive development. Indians and to a lesser extent South Koreans do not. Latin American, Middle Eastern and African publics see their countries benefiting from China’s economic growth. The Turks (18%) overwhelmingly see it the other way. China is clearly the most self-satisfied country in the survey. Nine-in-ten Chinese are happy with the direction of their country (87%), feel good about the current state of their economy (91%) and are optimistic about China’s economic future (87%). Moreover, about three-in-four Chinese (76%) think the U.S. takes into account Chinese interests when it makes foreign policy. In the midst of growing economic concerns in Europe, there is little indication of a broad public backlash against the European Union. 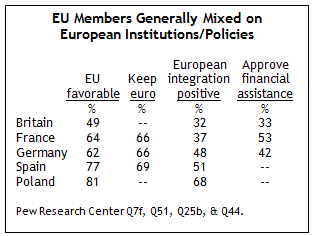 Large majorities in Poland, Spain, France and Germany and nearly half in Britain remain supportive of the Brussels-based institution. And European publics continue to have a positive view of German Chancellor Angela Merkel, who is well-regarded in Britain, Spain and France. In fact, as in the past, Merkel gets better ratings in France than in Germany itself for her leadership in world affairs. And French President Nicolas Sarkozy’s ratings are, if anything, somewhat better in Germany than in France. The French leader is less well-regarded in Britain and Spain, but that has been so in previous surveys. However, Europeans are divided in their views about major economic issues.2 They are supportive of the euro, but disagree about the merits of European economic integration and the bailing-out of EU member countries in trouble. Opinion of Greece, the recipient of EU financial aid, is on balance positive in Britain and France. But, a majority of Germans express an unfavorable opinion of it. At a time when NATO is developing a new strategic concept, majorities in major Europeans nations surveyed continue to hold a favorable view of it, as do most Americans. However, many fewer Germans express a positive assessment of it currently (57%) than did so in 2009 (73%). Germans who express opposition to the NATO effort in Afghanistan are far less likely to hold positive views of this defense organization (45%) than do those who back it (76%). This is also true, but to a lesser extent, in the other EU countries surveyed as well as in the U.S.
Support for terrorism remains low among the Muslim publics surveyed. 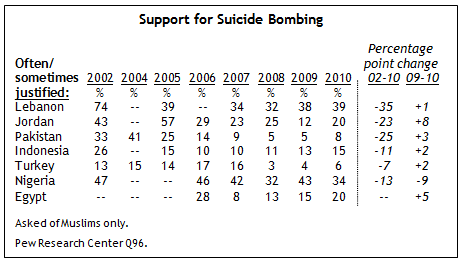 Many fewer Muslims in 2010 than in the middle of the past decade say that suicide bombing and other forms of violence against civilians are justified to defend Islam from its enemies. However, the new poll does show a modest increase over the past year in support for suicide bombing being often or sometimes justifiable, with a rise in Egypt from 15% to 20% and in Jordan from 12% to 20%. Still, these are below the levels of support observed mid-decade. Overall attitudes toward Osama bin Laden have followed a similar trend line among the Muslim publics surveyed by the Pew Global Attitudes Project. Views of the al Qaeda leader have been far more negative in recent years than they were mid-decade. And the poll shows considerably less positive regard for him in Jordan than was apparent in 2009. Support for bin Laden has also declined among Nigerian Muslims, although 48% still express confidence in the al Qaeda leader. Among the nations surveyed, there is widespread opposition to Iran acquiring nuclear weapons and considerable support for tougher economic sanctions against the Islamic Republic. For instance, more than three-quarters of those who oppose the Iranian nuclear program in Spain (79%), Britain (78%), Germany (77%) and France (76%), as well as 67% in Russia and 58% in China, approve of tougher sanctions. Many are also willing to consider using military force to prevent Iran from acquiring nuclear capabilities, including about half of those who oppose Iran’s program in Poland, Germany, Spain, and Britain, and roughly six-in-ten in France. Still, the Pew Global Attitudes survey foreshadows potential tension between the U.S. and other leading powers over what to do about the Iranian nuclear program. Among those who oppose Tehran acquiring nuclear weapons, Americans are more likely than Europeans, Japanese, Chinese, Indians or Russians to approve of economic sanctions against Iran and to support taking military action to stop Tehran from acquiring nuclear armaments. Pakistan is the only country in which a majority (58%) favors Iran acquiring nuclear weapons. Elsewhere among largely Muslim nations, public opinion on balance opposes a nuclear-armed Iran, although significant numbers of Jordanians (39%) and Lebanese (34%) do want Iran to have such capabilities. In predominantly Muslim countries, those who oppose Iranian nuclear weapons tend to favor tougher economic sanctions, and although fewer support using the military to prevent the Islamic Republic from developing these weapons, majorities or pluralities in four of the six countries surveyed favor this option. As in 2009, the new poll found substantial majorities of the publics in most countries seeing global climate change as a serious problem. The intensity of concern about this issue is less evident in the U.S., China, Russia, Britain and France than it is among the publics of other major carbon-emitting nations, such as Germany, India, Japan and South Korea. The publics of the 22 nations surveyed are more divided about paying increased prices to combat climate change. Willingness to do so is nearly universal in China and clear majorities in India, South Korea, Japan, Turkey and Germany also favor consumers paying higher bills. Most people express opposition in the U.S., France, Russia and many of the less affluent countries surveyed, while views are more mixed in Britain, Spain and Brazil. 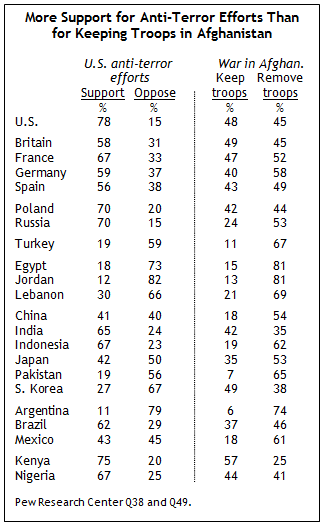 Somewhat more Americans than in 2005 (35% vs. 26%) think the U.S. is well-liked around the world. However, fully 60% think the U.S. is generally disliked. 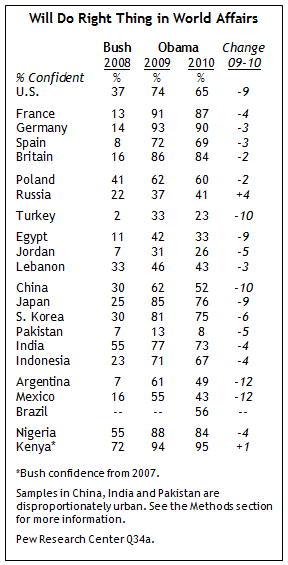 As in 2005, only Americans and Turks are more likely to say their country is disliked than to say it is liked. Americans are no more isolationist than Europeans. Asked whether their country should deal with its own problems and let others take care of themselves, 46% of Americans agree, as do 44% of Germans and 49% of British. The French are the most isolationist; 65% oppose helping other nations cope with their challenges. But Americans are among the least supportive of international trade among the 22 nations surveyed; nevertheless 66% think it is good for their country. While most Europeans and Japanese think Americans are too religious, people in the rest of the world – in 18 of 22 countries – think Americans are not religious enough. This includes the U.S., where 64% say their country should be more religious. Criticism of American secularism is particularly strong in the three Arab nations surveyed. Confidence in Russian President Dmitri Medvedev is on the rise, with his assessment up in all five EU member nations surveyed. The strongest backing is in Germany (50%) and the greatest improvement in Poland, where confidence in Medvedev has more than doubled in the last year, to 36%.